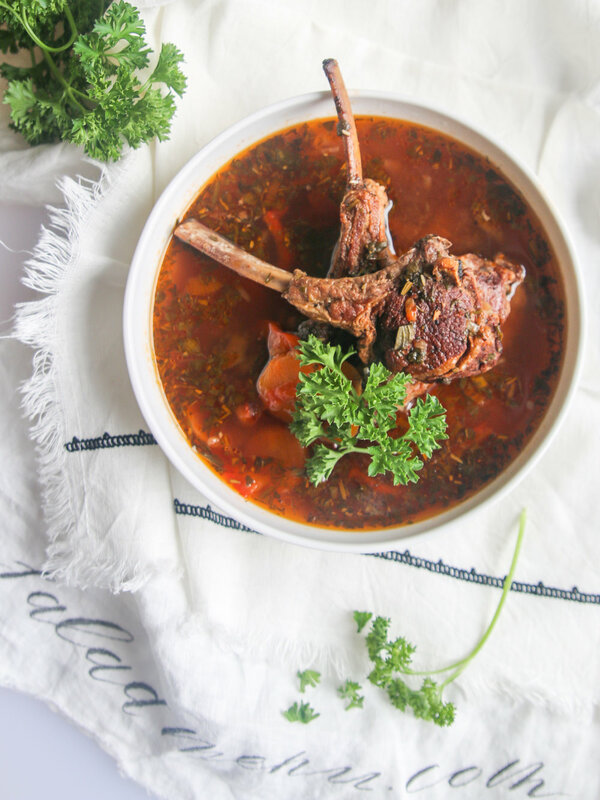 When I get home from a trip I usually make soup, like this one-pot healthy soup lamb and herbs or others that you could find here. Soup gives a comforting feeling of home, and is not heavy on the stomach. Soups are especially great after traveling in the winter. December is one of our busiest time of year, and not because of the holidays (that too), but we somehow managed to crammed in our wedding 13 years ago, just a week from Christmas day. And a week after Christmas it’s new years, but before we take out the fireworks and welcome the new year, we squeeze in my husband’s birthday which just happens to be new years eve. Last year we ended up taking a business trip to New York, which lasted for four days and the following day we had a birthday/new years party at our house. O I hope you followed all that, and boy am I glad that all that celebring is over. After all the parties and all the food, all I really needed was a bowl of fresh healthy soup ( and sleep). All in one-pot healthy soup? You bet-cha! No need for all extra pots and pans to make this lamb soup. It’s pretty much putting one thing after the next, and simmering for few hours, while you do all of your other tasks. We personally enjoy this healthy soup as a soup, but you could also add it on on mashed potatoes, rice, or quinoa, like a hearty meat gravy. In a large pot, on medium heat add 1 Tbsp olive oil. Sauté onions till transparent, about 5 minutes. Add in carrot and red bell pepper, sauté for another 5 minutes stirring occasionally. Take vegetables out on to a plate. Turn heat to medium-high, add in lamb chops. Sprinkle salt and pepper and give it a good stir. Brown up lamb chops on both sides. Turn heat back to medium, add bay leaf and all chopped herbs. Add 6 cups boiled water and stir in tomato paste. Turn heat to the lowest, put the lid on and simmer for 4 hours. In a large pot over medium heat add 1 Tablespoon olive oil. Sauté the onions until they are transparent (about 5 minutes.) Add in the carrot and red bell pepper, then sauté for another 5 minutes, stirring occasionally. Transfer the vegetables onto a plate. Turn heat to medium-high and add in the lamb chops. Sprinkle salt and pepper over both sides and be sure to brown them up on all sides. Turn heat to medium and add in the bay leaf along with all of the chopped herbs. Add 6 cups of boiled water and stir in the tomato paste. Add the vegetables back in and salt the soup to taste. Turn heat down to lowest, put the lid on and simmer for 4 hours.